The perfect solution to repurposing a kids trailer. 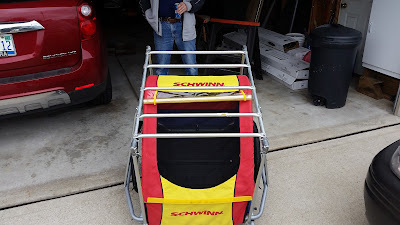 This is a stock photo of the Schwinn trailer I converted into a cargo hauler. Now some of you may have something similar to this hanging from the rafters of your garage collecting dust. 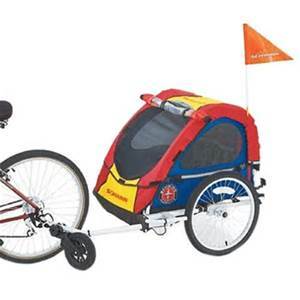 The other possibility to consider is now that the kids are growing, aren't you still going to go bike riding with them? Maybe to a metro park or state park? Maybe for a bike ride and cookout, or camping and swimming? Or maybe like me, start taking one of them on 6 day bike tours at the age of 9! Actually it was his idea and we rode 307 miles in 6 days. BUT, this was a fully supported tour, so it wasn't necessary then. Now however, we are going to do a 5 day 208 mile unsupported bike tour with nightly camping and cooking. In that light, I found myself looking for a good quality, large capacity cargo trailer for my bike, that wasn't too heavy. 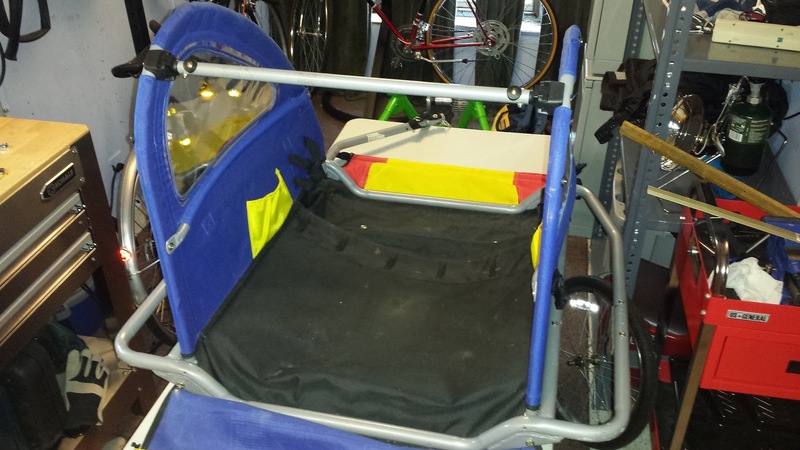 I found several, including the Burley Nomad and the BOB IBEX. both excellent trailers, lightweight and capable. 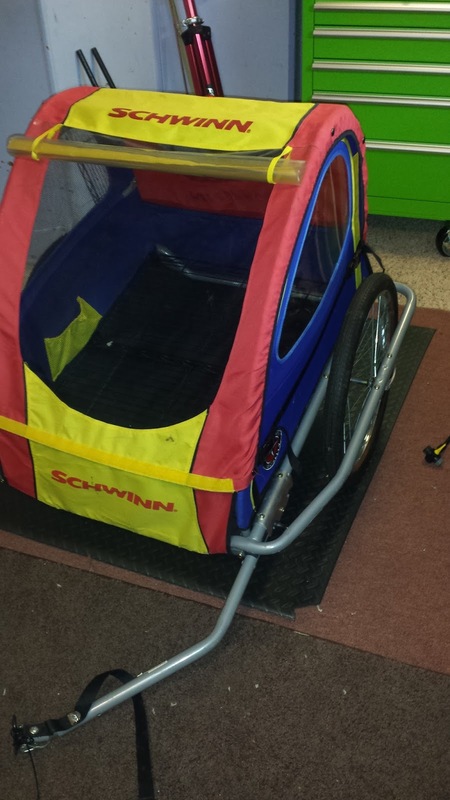 But when my grandson was 2 months old, I purchased the same Schwinn pictured above and always remembered that it was lightweight, (aluminum), and had 20" bicycle tires and wheels. 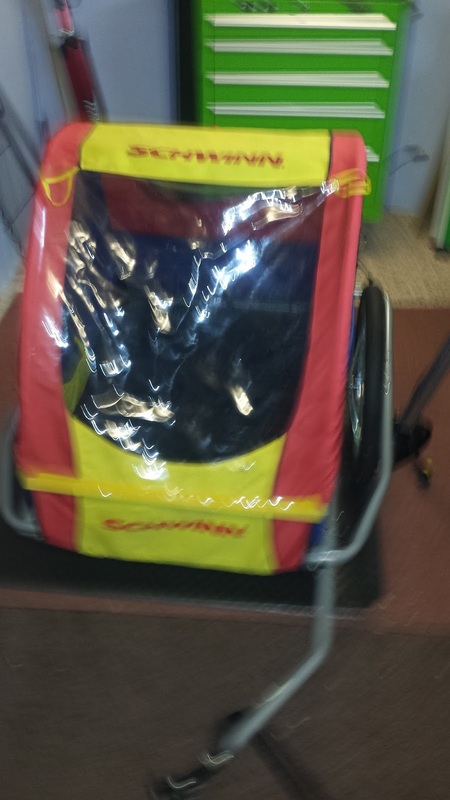 There are several kids haulers that use 16" plastic wheels and are made out of steel. These are of course cheap and available at any big box department store. So with this knowledge in mind I started looking for the same qualities in a cargo trailer and though there are a few with some of these features, I couldn't find one with all of them.....at least under $300! My quest took me to Craigslist and literally within minutes I found one just like the pictured at a reasonable $90. Since I was in my comfort zone having previously owned the same exact one, albeit 10 years ago. I bought it. Now I had to figure out a way to convert it without tearing it up and adding additional weight. 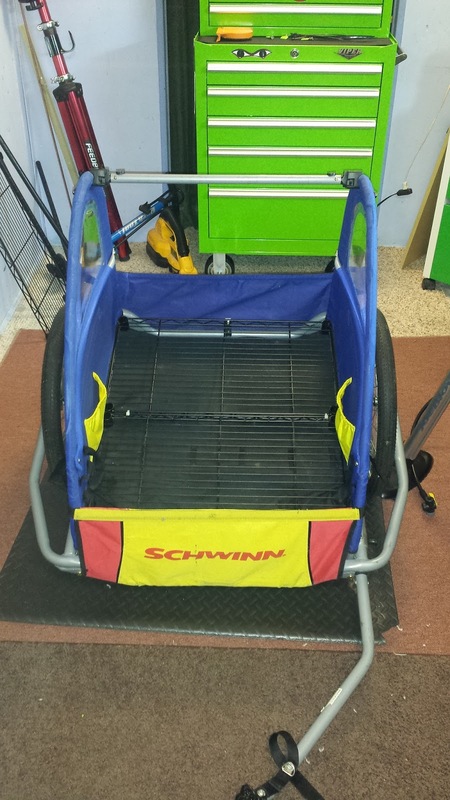 Since it is capable of carrying up to 100lbs....(2) 50 lb. children, I didn't want to decrease my overall capability. The floor is constructed of heavy waterproof canvas, and the kids harnesses are actually suspended from a top bar, so in essence the kids never really sit on the floor, they hang like in a hammock. Even though it looked fantastic after he sanded and stained it and polished it up, I wasn't interested in looks so much as function. Here is a link to his blog post if you wish to go that route. Its real pretty and certainly another option. Okay, enough already, lets take a look at mine. 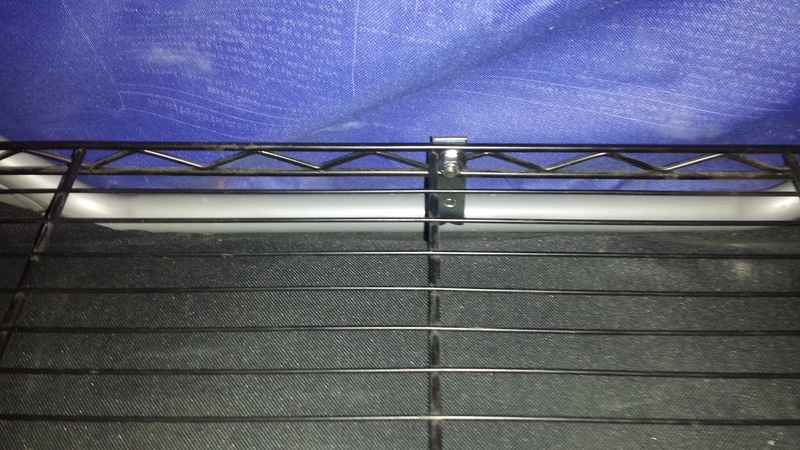 I accidentally found my solution by tearing apart a 3 tier wire rack, commonly found at Walmart/Home Depot and Lowes for less than $20. I tore out the kids harness stuff and laid in 2 of the shelves just to get an idea of size and what not, and VOILA! It was the perfect size and shape! WOW! That was too damn easy.....what's the catch? UHHHH, I got nothing. So with that problem solved, ( I was actually considering a 65 mile drive to my local IKEA store), I moved on to the next issue which was securing the shelves so they wouldn't bounce around and destroy the heavy canvas floor. A quick trip to Home Depot and I purchased a package of 3" L brackets and stainless steel bolts and washers and nylon nut for vibration resistance. 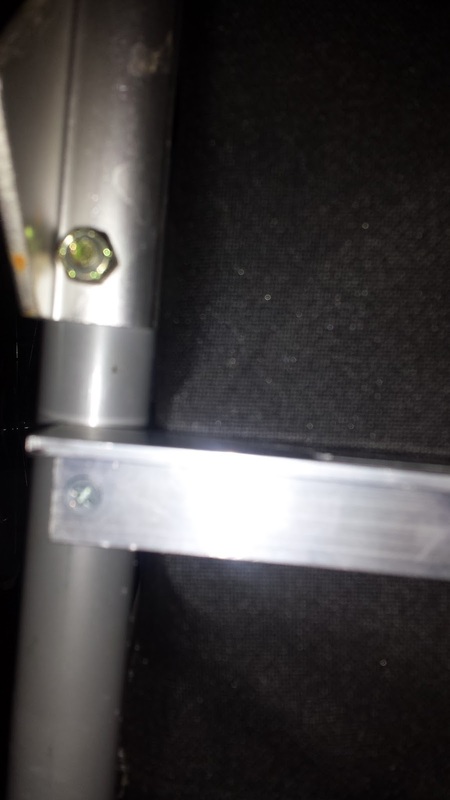 For the attachment to the aluminum frame of the trailer, I drilled an 1/8" hole and used the metal screws provided with the L brackets. after securing them I lopped off the excess with my dremel and filed down the sharp bits. I repeated this step on the other side as well. So now the shelves are secure to the frame and to each other and shouldn't bounce around. But, I was concerned that if I put enough weight on it to cause the center to bow downward, I might run the risk of ripping the canvas floor. 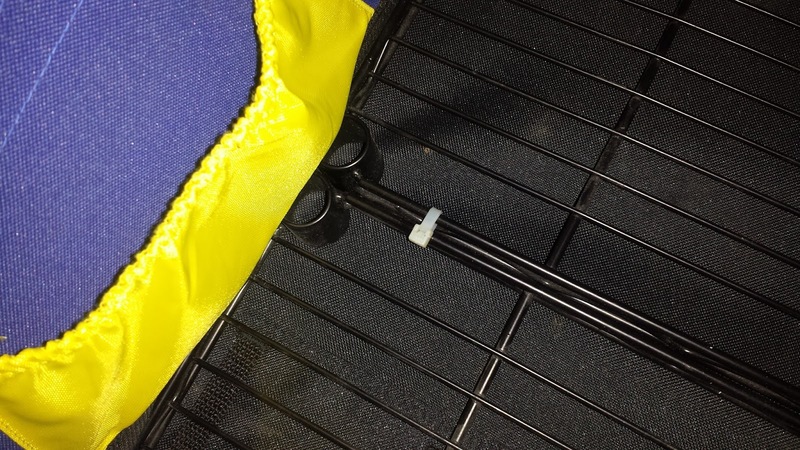 So far, I've been able to keep the water tight integrity, but if I punctured the floor, then it could rip and tear on a trip and possibly cause the trailer to be useless and with several pounds of gear laying on the road or trail. So my next issue was supporting the center of the 2 shelves where they meet in the middle. This is my favorite solution yet! I purchased a 36" aluminum angle bar from Home Depot. The trailer is 26" wide, so a 24" pre cut wouldn't work. I cut it to fit and placed it underneath the frame rails to support the center and I think it should handle the 100lb rating with ease. By using an angle piece, it is probably 10X stronger than a flat aluminum piece and hardly adds any discernable weight to the trailer. 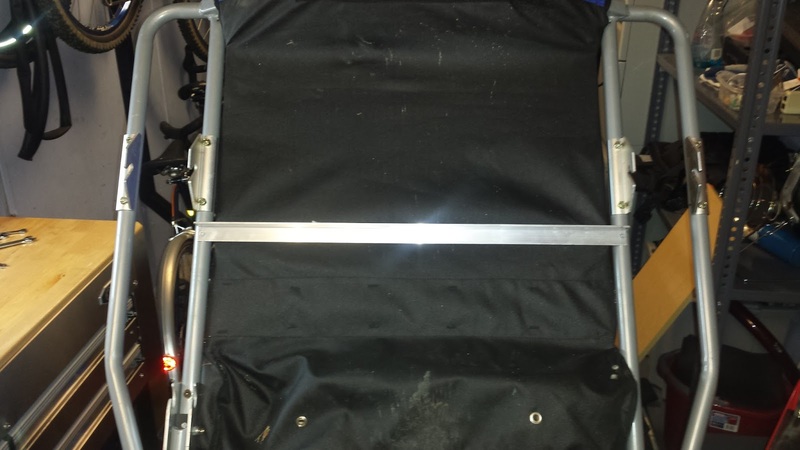 The round circles are indentations made by the rack. I placed the support in between the 2 shelves. I still need to clean the wheels and wipe down the canvas. And of course by an orange flag! 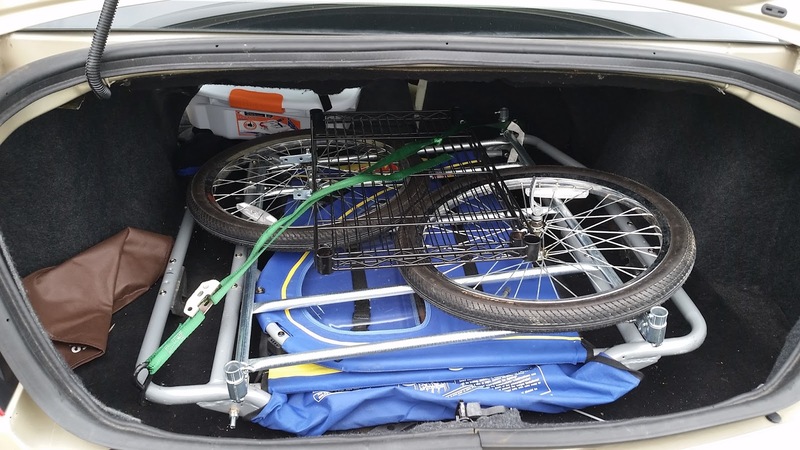 I am certain it weighs less than 25lbs and should carry more than the commercially available Bike cargo trailers. My total investment for the trailer and parts including the shelving is around $130. I'll report back after my first test pull. It went great! Pulled easy, very windy day and no issues. 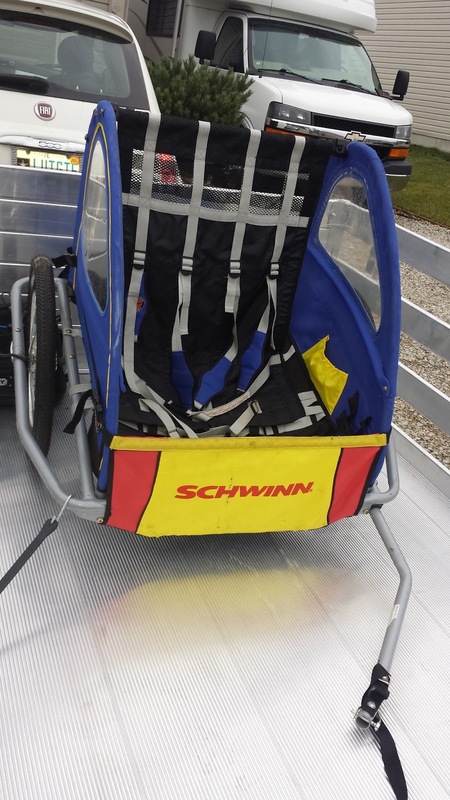 BUT......since it was designed for pulling children and not STUFF I discovered that anything longer than 30" wont fit. 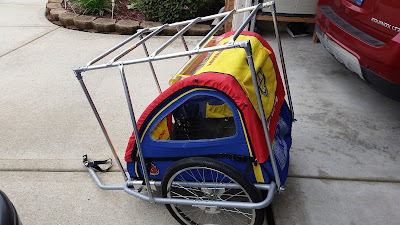 I enlisted the help of a friend of mine who is an excellent fabricator, and together we dreamed up this design. It attaches to 4 existing bolts at each corner and we added the side arms for rigidity. 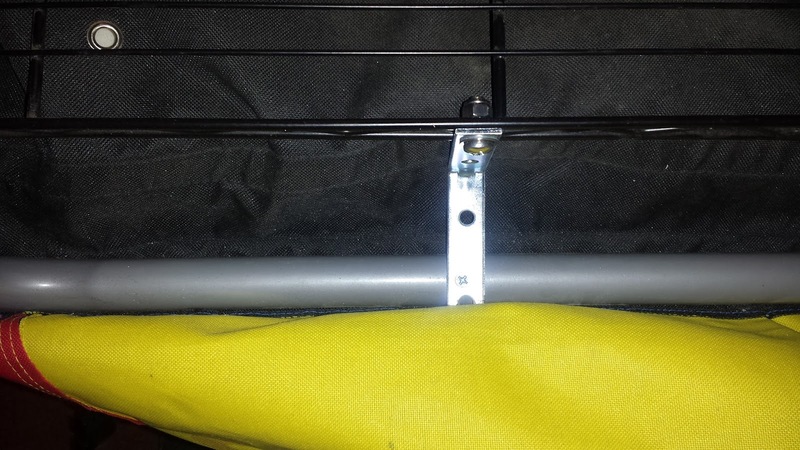 I changed the existing bolts and nuts to longer bolts with wing nuts to allow it to be broken down for easy transport. 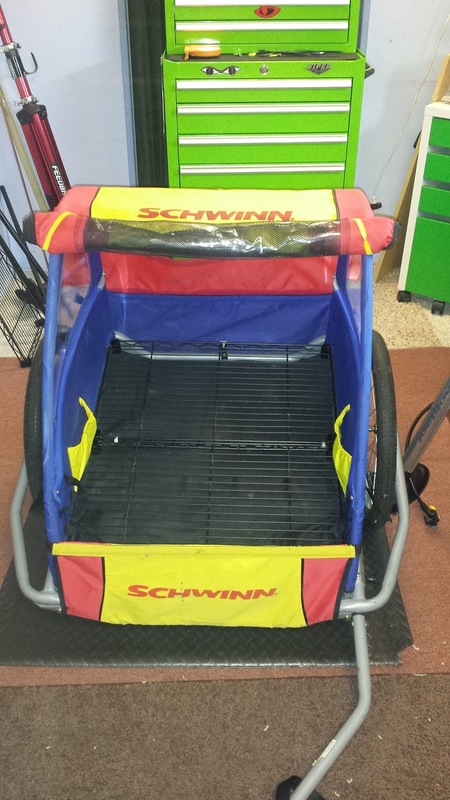 So now it can haul virtually anything up to and including a kayak I would think! Additional cash spent was $38 in hardware and a case of beer for Jim! Please feel free to ask questions or more detailed photos if you are interested. I am taking it on a 4 day bike tour on the GAP next month so I'll report back once more with pictures and a report.